View the proposed streetscape designs for Turnham Avenue in Rosanna. 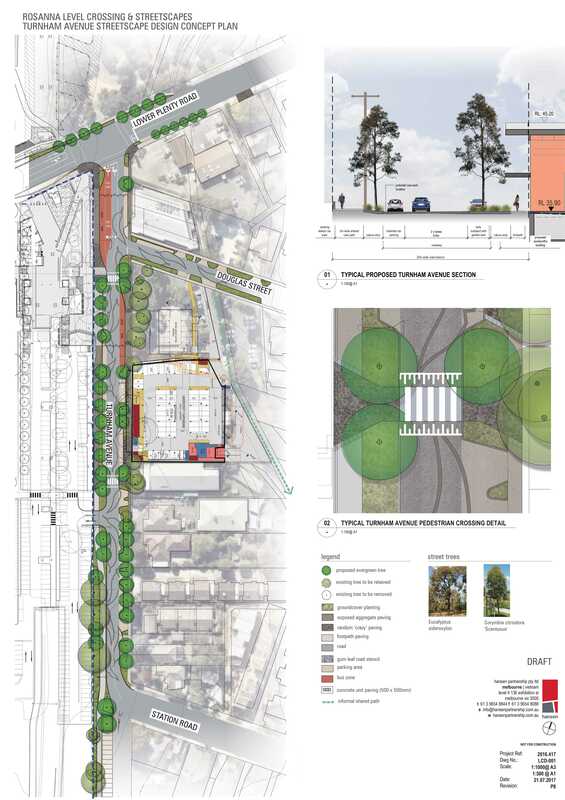 Turnham Avenue will be impacted by both the construction of the Lower Plenty Road level crossing removal (including the new Rosanna Railway Station, car park and shared use path) and the new Woolworths development. This presents an opportunity to significantly improve the streetscape in conjunction with these projects. Revised location of pedestrian crossings to provide better connectivity between the Railway Station and community facilities and Woolworths on the east side of Turnham Avenue. Direct pedestrian connectivity between Turnham Avenue and Beetham Parade through the Railway Station and commuter car park. A boulevard concept with new street trees on both sides of Turnham Avenue. Improved bus stop and kiss-and-ride location. Improved footpath and carriageway surface treatment. Thank you to those who provided feedback on the concept designs. We are now finalising the concept plans that will be presented to Council to adopt shortly. For further information or questions please email us at transport@banyule.vic.gov.au. What you think about the concept designs? Share your views and see what others have to say. This page also includes information on the urban design guidelines for the whole Rosanna shopping precinct. Learn more about this part of the project below! Thank you to everyone that contributed feedback to the Draft guidelines. The feedback received has helped amend the Draft guidelines. The guidelines were presented and adopted by Council on the 19 December. You can view a summary of community feedback and the final version of guidelines within this page. Rosanna will be undergoing significant change over the next two years. The State Government has committed $140 million to remove the Lower Plenty Road level crossing in Rosanna, and upgrade Rosanna Station together with the duplication of the railway line between Heidelberg and Rosanna. Works associated with the level crossing removal and rail line duplication are managed by the Level Crossing Removal Authority. At the same time, Council is investing in Rosanna Village, with money allocated this year to plan for future streetscape upgrades. These projects provide a real opportunity to create a more vibrant commercial center as well as improved community facilities within Rosanna Village. To help guide Council’s streetscape works and assist advocacy to the State Government, Council engaged a consultant to prepare draft Rosanna Village Urban Design Guidelines, Landscape Guidelines and Turnham Avenue Streetscape Plan. The documents will help guide the preferred future look and feel of Rosanna Village. Council engaged with the community around the draft guidelines. Several ammendments were made as a result of community feedback and the guidelines have now been adopted. These guidelines set the high level vision and priorities for the village and will provide the framework for future concept and detailed design projects. They will also be used to advocate to the State Government for the particular design outcomes that Council and the local community want to see for the Rosanna Station upgrade and level crossing removal works. The history of the project and the next key stages. Summary of community feedback prepared. Amendments made to guidelines. Council adopts Urban Design Guidelines on December 19. Council releases propose concepts for improving the streetscape along Turnham Avenue and invites community feedback.